This album is the sum of 11 years in the making. It began with Mary's San Diego local band, after she returned from her JUSTbecause Tour. She decided to get back into the studio and start a fresh album with Mary's current gig set lists. The band recorded 5 songs until life's obstacles got in the way. Summer tours were getting on the road, and so took her musicians, with plans for everyone to get back together in the fall once everyone returned from each of their respective Summer Tours. But it never happened. Instead, A few band members went on to join other tours and stay on the road. Some began new Studio business’ of their own, and Mary discovered over the summer how good it felt to actually stay home and work on her house projects! Music took a second fiddle after 20 years of dedication to performing and recording. Instead, Mary found comfort in following a spiritual epiphany that began on June 9, 2001! She believed that she was supposed to play golf in the U.S. Women's Open in 2008 at Interlachen CC in Edina MN. But first, she needed to buy a set of clubs and learn how to play the game! She found her first coach that day and began her new journey with a commitment that most would see as a full-time job! Their partnership as Coach and Player became an extremely tight bond and lasted three and a half years strong. Half way through the 7 year journey to the Women’s Open in 2008, the bond became broken and Mary fought to continue her dream and goal alone. She fought to find her soul and continue a broken journey. It was around that time that Mary was introduced to Rock and Blues Artist, Beth Hart. Beth invited Mary to come to one of Beth’s Thursday night club gigs in Orange County, California and sit in with the band. That was the night that music came back into Mary’s soul. She found her heart and spirit on that Stage singing Beth’s hit song, “L.A. Song” as a duet. Word got out on Beth Hart’s Fan club website “The Bethboard” about the duet and soon Mary received an email from a musician in Denmark who was a fan of Beth Hart and wanted to introduce himself. His name was Peter Kossek, and he was a musician/songwriter/composer/guitarist who also had a similar experience with Beth Hart in Denmark. He explained that he had written a Ballad entitled, “Give Me a Reason”, and he wanted to know if Mary would be interested in recording the vocals for his song. A ballad. Hmm? Here she was with a new found joy for singing, performing, and recording again and someone was asking her to do a project. More known for her bluesy rock genre, and even sometimes some acoustic folk, singing a pop ballad sounded like a challenge! Immediately, Mary began building her new 24 track digital full service recording studio, and Peter began sending instrumental tracks for Mary to synchronize and record her vocal tracks and send back to Peter in his studio. They recorded one song, and then another, and then another, and so on! Peter and Mary finally met each other in person after recording 4 songs when he came to San Diego to see Beth Hart perform live at the San Diego Indy Arts Festival. Their on-line easy communications transferred just as easily when they met in person! Truly these two talented musicians are the real deal! When the U.S. Women’s Open arrived June 2008, Mary was there! She followed her journey with her entire coaching team she had formed. She learned to learn from the best of the best. If she had quit the dream, she would have lost. Instead, she continued her path to the Open, not as a player, but as a coach! With music as her guide towards the end of her journey, Mary became a LPGA Golf Professional and now working to become one of the Top 50 professional Golf Coaches in the Golf Industry. She learned that the journey wasn’t about becoming a Tour player, but to take everything she learned on her epiphany journey and build new players of the future, and help them learn that anything is possible as long as you believe in your dreams! Mary wrote her last song for “Ballads & Blues” called “Believe in Me” which is about the incredible 7 year journey she took towards the U.S. Women’s Open at Interlachen C.C. So! 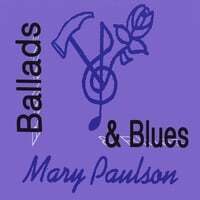 With the original 5 songs from Mary’s San Diego touring Band, and 5 songs recorded with Peter Kossek from across the great Pond… Palmay Music introduces a new collaboration of music as Mary Paulson’s second CD Album, “Ballads & Blues”. Latest comments of "Follow You Home"
"Changing a bit from rock to pop after the new vocal - but this turns out great anyhow. Great vocal and production and the Neal Schon solo sound stunning." "A real Peter Kossek power ballad Real good vocal - powerful with lots of expression and energy. She actually goes pretty deep - wow. Brilliant "
"Powerful pop ballad with a wonderful stirring vocal performance against a brilliant produced track. Kickin' guitar solo too....Nice"
RadioIndy is pleased to present Mary Paulson with a GrIndie Award for the CD "Ballads & Blues "
Mary Paulson has compiled a beautiful blend of soft rock ballads with influences of country and blues on her latest disc, “Ballads & Blues.” Paulson is quite a talented singer as her vocals are clean and polished with fine clarity. She seamlessly transitions from one style to another, showing impressive versatility. The Hammond organ solo on “My Summer” captures the upbeat twelve bar blues feel while the vocals and band are solid and tight. Turn the tables around and get a taste of country spice on “Believe in Me” with the banjo and fiddle balancing the mix on this tuneful song. “Give Me a Reason,” written by Peter Kossek who resides in Denmark, is strong and powerful with lyrics that will tug at your heart. Another ballad that is stunning is “Untouchable Love” with an electric piano accompaniment that has a hint of bluesy flavor. If you’re in the mood to just kick back and unwind to some relaxing music, then toss on “Ballads & Blues” and let the music take you away. RadioIndy created a CD Announcement Press Release on Digg.com! Mary Paulson is on MySpace.com! "Ballads & Blues" Reviewed by RadioIndy.com! One of Peter Kossek's instrumentals has been captured on You Tube! Peter is the left and right hand to "Ballads & Blues" while he also enjoys dabbling in such tunes as like the one seen here! The irreverent and high energy of live performance. The sliding exhilaration of cleansing raw, impressionable bluesy rock and rockin blues. These are the anchors dug into ‘JUSTbecause’, the first album recorded in 1995 for Mary Paulson. Mary has been a dark horse in the Music Industry since 1986 at the age of 23. Prior, this vocal dynamo began captivating her audiences at the early age of 12 in Edina Minnesota where she formed her own acoustic band and began writing her first songs and performing at 500 seat venues. After completing her formal studies and education at the University of Minnesota music program in Voice and Music Theory, Mary relocated to San Diego, CA. Starting from the ground up by playing her guitar and singing her songs at every café, coffee shop, night club, and open mic nights, Mary became heavily involved in the Indy Scene and began recording for Demo projects as a back up vocalist. This insistent songwriter self produced two earlier demonstration recordings, My Summer, and Mary Paulson 92’, which began a whole new popularity in coffee house music in Southern California. In 1987, Mary worked seasonally as a firefighter for the U.S. Forest Service, then transferred to the Federal Fire Department in San Diego, CA where today she holds the position as Engineer /EMT. During a period of traveling every weekend to San Francisco, CA for Recording jobs, and working on her own music, the road took a toll and she moved to the Bay Area to pursue her music carreer as a recording artist and a live performer. Unfortunately, bands break up and Mary’s band was no exception. Deciding to undertake vocal recording specific lessons, Mary met her new vocal coach in a local newspaper ad, who soon was to become her record producer, Teresa Trull. Together, their partnership excelled new dimensions combining Mary’s strong impressionable voice with Teresa’s precise and multifaceted technical skills in the studio. Between these two enviable talents, nothing short of perfection created JUSTbecause.